The Port of South Louisiana may not have the name recognition of the ports of Houston, L.A./Long Beach or New York and New Jersey, but its significance to the economy of the United States is nonetheless unmatched. Just consider the superlatives, said Paul Aucoin, the port’s executive director. 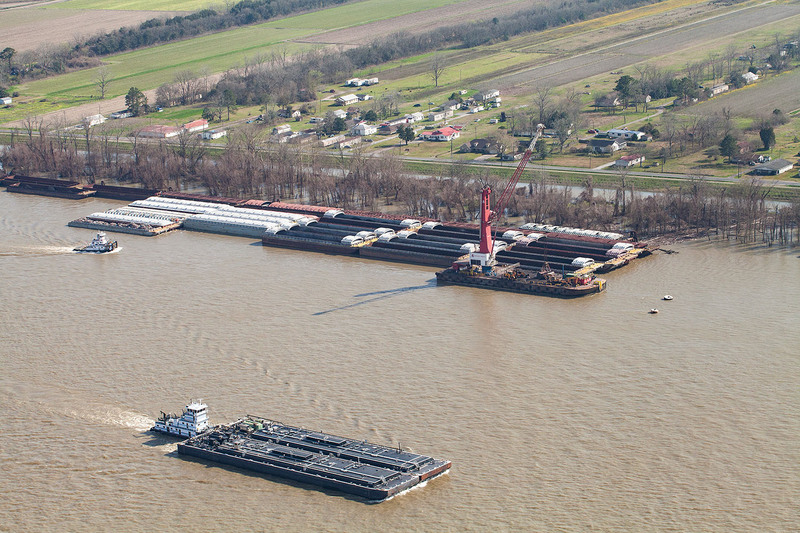 Aucoin said a whopping 63,000 barges called on the Port of South Louisiana last year, with the vast majority of those carrying grain from farms upriver. Stevedores then load those cargoes onto ships bound for foreign markets. “Give or take, we export grain to 90 different countries at any point in time, so we have our U.S. grain shipped all over the world,” Aucoin said. The Port of South Louisiana, with a jurisdiction within the parishes of St. John the Baptist, St. James and St. Charles, stretches across 54 miles and both banks of the Lower Mississippi River. That large jurisdiction also means the Port of South Louisiana is the largest foreign trade zone in the United States. “That plays an important role, especially in the transfer of oil, which we do a lot here,” Aucoin said. The port includes 10 oil storage terminals, with a storage capacity of 217 million barrels of oil, and four major refineries, which boast a daily output capacity of 1.4 million barrels. Besides oil coming into the port by barge, road or rail, major pipelines also feed into the Port of South Louisiana, including the new Bayou Bridge Pipeline. To explain the significance of the foreign trade zone, Aucoin used the example of a unit train that might come from Canada to a storage terminal in the Port of South Louisiana. Aucoin said the port is second only to Houston as an energy port. The port is also home to a legion of petrochemical manufacturers that dot both sides of the river, with even more on the way. Aucoin said some $24.2 billion of new capital investments have been announced within the jurisdiction of the Port of South Louisiana, with about half of that tied to foreign direct investment. Recent announcements include a $1.25 billion manufacturing facility where Wahnua Chemical Group will produce methylene diphenyl diisocyanate (MDI) and a $2.2 billion project by South Louisiana Methanol. Aucoin said in 2018, those three main categories of cargoes—grains, oil and petrochemicals—combined for a total tonnage at the Port of South Louisiana of more than 300 million tons. That’s up from just over 275 million tons in 2017. Houston is the nearest competitor based on tonnage, with New York and New Jersey a distant third, according to 2017 statistics. Aucoin was fast to attribute the port’s success to a simple rule of real estate—location. “A lot of our success is based on this great natural resource we have in the Mississippi River, and we’re fortunate to have jurisdiction over 54 miles,” he said. And even with all that success, the Port of South Louisiana is actively building for the future and advocating for further development of the Mississippi River ship channel. From a port development standpoint, the Port of South Louisiana has announced $54 million in projects, including the acquisition of new cranes, new or refurbished warehouses and upgraded docks. The port has also invested $2.8 million in upgrades at its regional airport. But Aucoin was quite clear: His top priority is the deepening of the Mississippi River Ship Channel to 50 feet. “That’s the No. 1 infrastructure project for the entire United States, as far as I’m concerned,” Aucoin said. 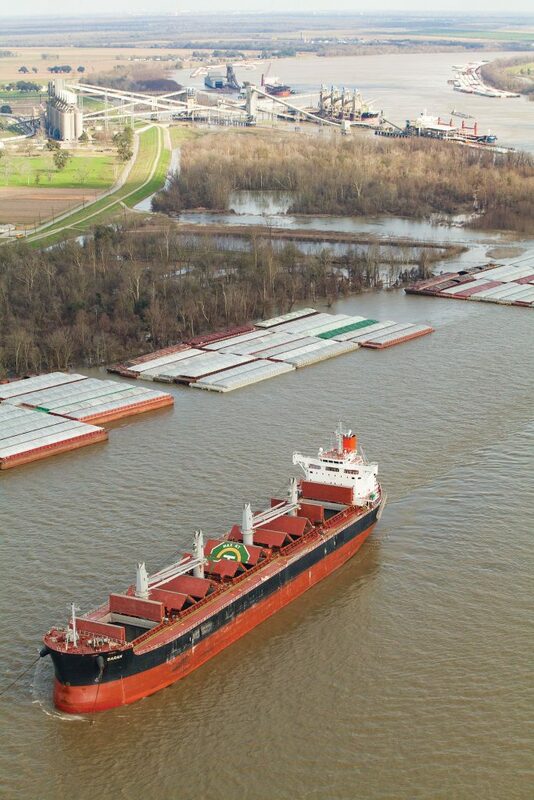 Aucoin emphasized the oft-repeated statistic that, for ships operating on the Mississippi River, every foot of lost draft means a loss of $1 million. With ships getting larger, and with the anticipated growth in demand for U.S. agricultural products, deepening the river—and reliably maintaining it—is a global priority. The U.S. Army Corps of Engineers officially endorsed the deepening project, which would bring the river to 50 feet from the mouth up to Baton Rouge, in August 2018. Now advocates await congressional funding. Total cost for the project is estimated at just under $240 million. Aucoin said deepening the river and reliably maintaining it at 50 feet will not only benefit farmers getting produce to market and shippers who can move more cargo, it will also make the United States more competitive in the world market.